SAN FRANCISCO — Netflix said 45 million subscriber accounts worldwide watched the Sandra Bullock thriller “Bird Box” during its first seven days on the service, the biggest first-week success of any movie made for the company’s nearly 12-year-old streaming service. The first-week audience means nearly one-third of Netflix’s 137 million subscribers watched the movie from Dec. 21 through Dec. 27 — a holiday-season stretch when many people aren’t working and have more free time. Had 45 million people actually gone to a theater in the U.S. to watch “Bird Box,” it would have translated to about $400 million in box-office revenue, based on average ticket prices. But people were watching the movie on a service for which they already had paid and had the luxury of doing so without leaving their homes. 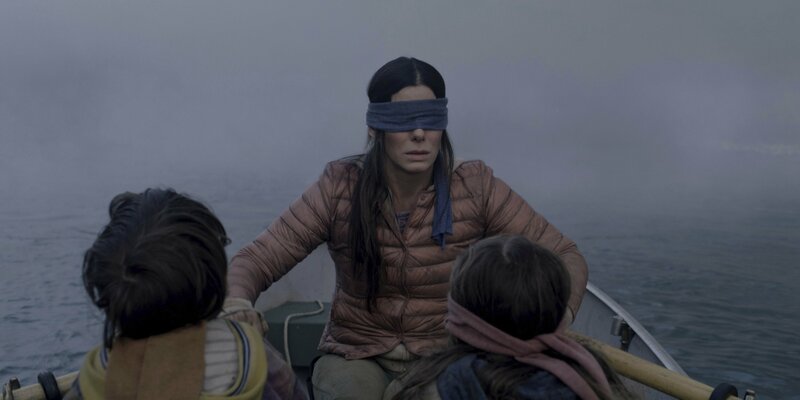 That makes watching “Bird Box” more comparable to watching a television program, Wedbush Securities analyst Michael Pachter said. By that yardstick, the viewership for “Bird Box” is less impressive. For instance, the Super Bowl typically attracts 100 million to 110 million viewers in the U.S. alone. The annual telecast of the Academy Awards has drawn a U.S. audience of 26 million to 40 million in recent years. And those totals are for a single day, not a week. Television viewership and theatrical box-office numbers are typically calculated by third-party firms, unlike the “Bird Box” figure released by Netflix. The Los Gatos, California, company has steadfastly refused to divulge its viewership because it regards the data as a competitive advantage in deciding what programs will attract subscribers. All Netflix will say about its “Bird Box” number is that it counted only accounts that watched at least 70 percent of the movie. Multiple viewers sharing a single account are counted once. Netflix so far has made its biggest splash with highly acclaimed TV series such as “House of Cards,” ″Stranger Things,” and “The Crown.” ″Bird Box” is the latest example of the company’s resolve to become a bigger player in movies, too. To pull it off, Netflix is borrowing billions of dollars to pay for original movies and TV series. But beyond money, Netflix needs to appease directors and actors who want their work to also be seen in movie theaters, both for their larger screens and for award consideration. That’s why Netflix has been arranging for films like “Bird Box,” ″Roma,” and “The Ballad of Buster Scruggs” to have limited runs in theaters first. That’s a strategy that Amazon had already been following, enabling its “Manchester By The Sea” to win Academy Awards for best actor and original screenplay in 2017. An ESPN documentary, “O.J. : Made In America,” also won an Oscar in 2017 after appearing in theaters before its debut on the TV network. By breaking tradition and disclosing viewership numbers for “Bird Box,” Netflix cleverly created even more buzz, Pachter said. “They are masters at getting attention and they knew revealing the numbers would get the media to write about it,” he said. Netflix quickly found itself grappling with another problem Wednesday as it acknowledged censoring an episode from its “Patriot Act” series in Saudi Arabia to comply with laws in that country.